Keep Records of every improvement and maintenance of your home. Remember back when you bought your home. You were so nervous because you didn’t want to buy a home that had problems? Every buyer goes through the same feeling. You want to be able to buy something with good piece of mind. The best sellers are the ones that know everything about their home. Keeping good records of work completed and maintenance completed gives the buyer that piece of mind. In most markets, you have to find a way to put your home ahead of the competition. With these records, your buyer may have more understanding of your home rather than another that they don’t know anything about. Whether it’s termite treatment, appliances, hvac work or checkup, toilet repair, or even window cleaning, having those records will put your home over the top. It is a cliché but it is so true. Finding the right time to put your home on the market is key. How do you know when the right time is? That is what your Gratz Agent is for. They know what is happening in Central Missouri and can give you insights. One example is if there is major road work about to be completed near your home, it may not be a good time to sell. There are a lot of external factors that go into selling your home that a Gratz Agent can advise you on. This is one of the biggest keys to real estate. We see it too often that sellers will price their homes to high and then have to sell it for less than they want. When you price a home first, that price will always stick with it. The first three weeks of having your home on the market are the most important. If you price the home to high, it will continue to sit on the market. Eventually you will have to drop the price. Once you do, some of the buyers that may have looked at it could have already found something else. After a few months, people will start to question why it hasn’t sold. We get comments such as “What is wrong with the house? There has to be something wrong with it if it hasn’t sold.” Avoiding this alone is one of the biggest ways to make the most money when selling. We know, it’s hard to keep your house clean, especially with kids. Being able to de-clutter your house will make it look more open and inviting to potential buyers. Using your attic space to store stuff while your home is on the market is highly recommended. Try to remove any large piece of furniture or toys that are not being used. Once your de-clutter, you may want to try to modernize your house. Here is where you contact a Gratz Agent. Our agents will help guide you on what improvements will help you get a better return on your home. Whether it be doing a little painting, adding some new modern décor, updating flooring, or even just deep cleaning, we will be able to help. We don’t want to run into a situation where you spend too much money and can’t get it back out of the house. Always call your Gratz Agent first before starting big improvements. 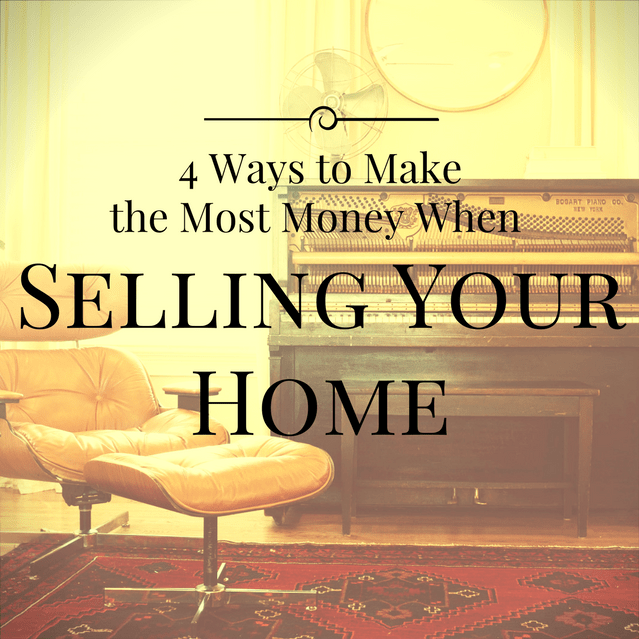 Completing these four steps will bring you a higher return every time. Most of these are simple tasks and can be completed with little effort. Taking the time to keep records will help show you were a clean and well maintained homeowner. This is put your home ahead of the rest, not only by selling quicker, but for more. Finding that right time to sell your home can lead to higher returns. Make sure the market and external factors are favorable when you do. Along with that, pricing your home correctly will always bring you more money than pricing too high. Finally, de-cluttering and modernizing will lead to more cash in your pocket. Find the beauty in the home you saw when you bought it and bring that back to life for your potential buyer. Always remember, our agents are here for you anytime, not just when you need to buy or sell. Call us for any questions on home improvements or market conditions and hey, ConGratz on being a home owner.